Heart disease is the nation's No. 1 killer (616,067 in 2009), according to the Centers for Disease Control & Prevention. One medical breakthrough was reported just over a month ago. A study published in The Lancet and presented at an American Heart Association meeting in Orlando, Fla., showed heart failure patients given stem cells taken from their own bodies showed dramatic and lasting improvement, reversing heart damage and even growing new heart muscle. As with most breakthroughs, it will take years before this therapy is confirmed, proven safe and becomes an accepted part of heart disease treatment. Until this or some other magic bullet arrives, most people – following the advice of their doctors – look to food for improvement of their heart health. There are two intertwined strategies for making food products heart-healthy: take out the bad and put in the good. "By removing or reducing components that are not heart-healthy, such as cholesterol or saturated fat, and replacing them with healthier alternatives, such as soy protein, product developers are able to significantly boost the health value of foods," says Noel Rudie, director of research at Harvest Innovations (www.harvest-innovations.com), Indianola, Iowa. "Another example is reducing the amount of saturated fat in a product and replacing it with dietary fiber, which is effective in lowering cholesterol." Harvest Innovations processes various soy products plus legumes, egg replacers and expeller-pressed oils, all with an emphasis on hexane-free processing. Two recently introduced soy-based ingredients provide heart-healthy benefits. "The first is called HIsolate. It is a non-GMO, hexane-free, 65 percent soy protein that functions like an isolate in meat, pasta and beverage products," Rudie explains. "It is a cost-effective ingredient that allows producers to offer a more economical way to add a natural and healthy protein to their food. "The second product is Egg-Out, which can replace 100 percent of the function of egg in certain food products," he continues. "Egg-Out is a fraction of the cost of egg whites, with all the functionality of eggs offering substantial savings for food manufacturers. The base formula can be made with either soy or pea protein, as a non-allergen alternative." Textured soy protein (TSP) is used for its low cost and high nutritional content as an extender in meat and poultry products. "Textured soy proteins have been used for more than 50 years as a replacement for ground meat," says Bob Kaegi, director of protein applications and seasoning at Wixon Inc. (www.wixon.com), St. Francis, Wis. "When fortified with vitamins and minerals it is nutritionally equivalent to animal protein." But without many of the heart-damaging effects of animal proteins. Kaegi says that TSP is also used in vegetarian meat analogs that contain no meat whatsoever. "The flavor in the vegetarian meat analog typically is achieved through the use of seasonings and other non meat flavors. There are all kinds of meat analogs on the market today ranging from breakfast sausage analogs, Sloppy Joe analogs, veggie burgers to shredded chicken analogs, and they are all healthy, low-fat meat protein substitutes." There is, however, a debate now about soy's health benefits. In addition to its positives -- protein and phytosterols -- it also contains estrogen-like compounds and phytic acid, the latter of which may inhibit the absorption of iron, zinc, calcium and magnesium. Even the FDA is no longer convinced of its heart-healthy attributes, and soy's health claim (for reducing LDL cholesterol) remains under review by the food agency. Focus on healthy arteries could be poised to become the next big trend in cardiovascular health, with products claiming to reduce oxidized LDL, or bad cholesterol, hitting grocery store shelves in the U.S next year, reports FoodNavigator.com. St. Charles, Mo.-based Stratum Nutrition is currently in talks with U.S. food, beverage and supplement manufacturers about product launches that would contain its novel new fiber Artinia, which claims to control the oxidation of LDL cholesterol in the arteries. The odorless, light yellow powder behaves like an insoluble fiber, according to the company, and can be used in drinkable yogurt, smoothies, bread, baked goods, cereals, and nutrition bars. The emergence of artery-cleaning foods could pave the way for a new category altogether in the functional foods market. Meanwhile, Fruitflow, a product made from ripe tomato extract in syrup form, also claims to promote improved blood flow for a healthy heart and cardiovascular system. It is the first ingredient of its kind to receive an approved health claim from the European Food Safety Authority. Provexis Plc, Berkshire, UK, holds the patent for FruitFlow. Plant sterol/stanol esters and risk of coronary heart disease. In addition to textured soy proteins, Wixon offers another option to manufacturers. "Oat fiber performs like soy protein concentrates and isolates and is being used in processed meats," says Kaegi. "It improves texture and cook yields by not only adding more water but by holding on to more water that normally would be purged from the meat. "Although higher in cost, oat fiber has a neutral and clean flavor in meats, which makes it more desirable than soy products, which are considered an allergen and can have an off-note typically described as ‘beanie,' " he continues. Quaker Oats, of course, has had quite a run with the connection between oats and lower cholesterol. The brand devotes quite a bit of its web site (www.quakeroats.com) to the science of heart health. Cargill successfully petitioned the FDA in 2008 to include barley betafiber as an authorized source of soluble fiber, and thereby to be included in fiber's heart-health claim. Cargill claims to be the only producer of barley betafiber; therefore, its Barlív product is the only barley beta-glucan concentrate that qualifies for the FDA health claim. A six-week clinical study, conducted at the University of Minnesota by Dr. Joseph Keenan, found barley betafiber, when consumed as part of a heart-healthy diet, significantly improved total cholesterol and LDL-cholesterol levels. You can read more about Cargill and its newest products and formulations on our Formulating Ideas blog. Formulating Ideas is written for technical professionals by Cargill's food and beverage scientists. 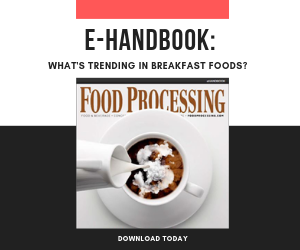 FoodProcessing.com and Cargill have partnered together to address the key challenges facing food and beverage formulators and ideas for solving them. Visit the Formulating Ideas blog. Another grain of interest, though not so much for its fiber but for its alpha-linolenic acid (ALA), is flax. ALA, the only essential omega-3 fatty acid, plays unique roles in maintaining human health, performing many of the same functions as eicosapentaenoic acid (EPA) and docosahexaenoic acid (DHA). Among the many health benefits credited to ALA is metabolizing cholesterol. ALA increases the omega-3 fat content of cell membranes, which makes them more flexible and improves functionality. It regulates the heart beat, thereby reducing the risk of sudden cardiac death. ALA also reduces inflammatory reactions in the body, reduces blood pressure and significantly contributes to EPA and DHA requirements. Diets rich in ALA lower the risk of coronary heart disease (CHD), ischemic heart disease (IHD), nonfatal myocardial infarction, and stroke according to numerous recent studies, says Marilyn Stieve, business development manager at Glanbia Nutritionals (www.glanbianutritionals.com), Fitchburg, Wis. In 2003, following a campaign by the International Tree Nut Council, the FDA issued a "qualified health claim" that eating 1.5 oz. of most nuts "may reduce the risk of heart disease when they're part of a diet low in saturated fat and cholesterol." Nuts contain several antioxidants, including vitamin E and selenium, along with plant sterols and other phytochemicals that aid in heart health. One study cited by the Almond Board of California (www.almondboard.com), Modesto, Calif., described how almonds reduce inflammation by about the same level as taking a first-generation statin drug. A more recent study, published in the June 2010 Journal of the American College of Nutrition, not only confirmed earlier cholesterol findings but also showed almonds may treat and possibly prevent type 2 diabetes. Dallas-based The American Heart Association (AHA) expanded and improved its Heart-Check Food Certification Program last fall to allow certification of more foods with healthier fats, including fish, nuts and other foods higher in monounsaturated and polyunsaturated fats. And the AHA revised sodium allowances and implemented screening guidelines to limit added sugars and promote dietary fiber in certified products. Foods eligible for certification are fish, nuts and other foods that contain heart-healthy benefits including better fats, monounsaturated and polyunsaturated, while limiting negative nutrients such as saturated fats, trans fats, cholesterol and sodium. To allow food manufacturers time to reformulate their production processes, the updated requirements covering sodium, sugar and fiber will be effective in 2014. Now more companies can certify products and use the famed red-and-white Heart-Check mark, which has helped shoppers select healthy foods for more than 15 years. The Heart-Check mark is the leading health symbol of its industry, and recent research shows consumers are more likely to buy a product bearing the symbol. Compared to other leading on-package icons, the Heart-Check mark has the strongest aided brand awareness, trust and purchase intent. The Heart-Check mark symbol now makes it even easier for consumers by offering more simplified language and greater visibility on the package. The study suggests that consuming an American Diabetes Association-recommended diet consisting of 20 percent of the total calories from almonds for 16 weeks is effective in improving LDL cholesterol levels and measures of insulin sensitivity in individuals with pre-diabetes. Nutrients in almonds, such as fiber and unsaturated fat, have been shown to help maintain healthy cholesterol levels and increase insulin sensitivity, both of which help to prevent the development of type 2 diabetes and reduce the risk of cardiovascular disease. "It is promising for those with risk factors for chronic diseases, such as type 2 diabetes and cardiovascular disease, that dietary changes may help to improve factors that play a potential role in the disease development," says Michelle Wien, assistant research professor in nutrition at Loma Linda University's School of Public Health and principal investigator for this study, which was conducted at the University of Medicine and Dentistry of New Jersey. Another ingredient that has been the subject of great health debate, especially regarding hypertension, is sodium. When the 2010 revision of the Dietary Guidelines for Healthy Americans was being deliberated, there were impassioned pleas both ways: to reduce the daily limit of sodium from the 2005 recommendation (2,300mg) or whether the entire connection between sodium and high blood pressure should be thrown out. Despite recommendations from their own advisory committee to lower the limit to 1,500mg per day, the USDA and Dept. of Health and Human Services allowed the 2005 limit to stand. Correct or not, many consumers are buying into the connection between sodium and high blood pressure. Food processors are meeting that demand with varying degrees of conviction. While salt is often used synonymously with sodium, St. Louis-based ICL Performance Products LP (www.icl-pplp.com), has been keying on non-salt, hidden sources of sodium in baked goods and other foods, specifically leavening agents sodium aluminum phosphate or sodium acid pyrophosphate. The company in 2006 introduced its Levona line of calcium-based ingredients to leaven delicately flavored bakery products without sodium and without negatively affecting their taste or texture. ICL has been developing calcium, magnesium and potassium phosphates for more than 100 years. "In the last several years ICL has focused their attention on the role these minerals play in heart health," says Nadeen Myers, food phosphate specialist. Magnesium deficiency has been linked to high blood pressure. "It is believed that magnesium stabilizes the heart rhythm and relaxes the muscle that dilates the arteries, therefore reducing blood pressure," she says. "It works in partnership with calcium to ensure the normal rhythm of a beating heart. Magnesium is one of the minerals lost during food processing, so fortification is the primary means to replenish this mineral. Magnesium, like the other minerals critical to heart health, has an RDI [recommended daily intake]. For healthy adults, it is 350-420mg per day." "Per the 2010 Dietary Guidelines, published earlier this year, calcium and potassium are classified as nutrients of concern," says Myers. "Several studies have shown that potassium regulates blood pressure and blunts the impact of sodium on the diet. Like calcium and magnesium, potassium also plays a role in normal muscle contraction. While there are several food sources that contain potassium (leafy green vegetables, orange juice and bananas), the majority of Americans do not consume the RDI for potassium of 3,500mg." And if you must add salt, many food processors are looking seaward for their salt. Sea salt is naturally low in sodium, with only 1.7g of sodium in every 100g compared to 39g of sodium in 100g of sodium chloride, according to Myers. ICL this year introduced Salona low sodium sea salt. "It allows for a 25-50 percent replacement of sodium chloride," Myers says.